Before the settlers came to our area, when south-central Wisconsin was still wilderness and large areas of unsettled wild territory, two small creeks flowed together to form the Crawfish River. It was on a ridge above the Crawfish River that A. A. Brayton first built his house and store in 1845. That same year Brayton constructed a mud-log-and brush dam across the Crawfish. The dam has been rebuilt, repaired and rehabilitated several times since 1845 and is currently used to control water flow and level of a small lake behind it, known as Lazy Lake. 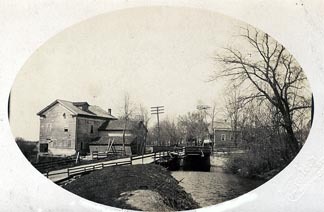 Brayton continued his development with the erection of a sawmill at the source of waterpower and began to manufacture the supply of lumber that was to be used to construct the village. By 1850 Brayton had diverted the part of the water flow through a narrow “flume.” The force of this water flow, although often times erratic, powered his new gristmill, which has now been in some form of operation for nearly a century and a half. The mill has progressed from waterpower to gasoline engines, burned down several times and changed ownership many times. Still the mill serves as a gathering place for area farmers today as yesterday, and one can easily suppose that the temptation to major in wet pant legs as opposed to English, is still considered by the Fall River children on their way to school. There are, after all, some things that never change! In today’s world, planning and design of a community is a project for professionals. However, the Village of Fall River seems to have sprung up somewhat by accident. The first group of settlers chose the ridge running southwest by northeast and in a nearly straight line from the historically marked Portage Trail west to a corner farm settlement known as the Dargan-Birkenstock-Sennhenn corner. Directly east of this string of settlements, A. A. Brayton settled his businesses this forming an “east” end of the Village, the dam area. The other settlers establishment became know as the “west” end and the railroad tracks, constructed in 1866, pass through the west end, approximately ½ mile from the east end. Thus the village began to grow toward the “west” end and the railroad tracks, creating a long New England like main-street with only short spurs branching off. 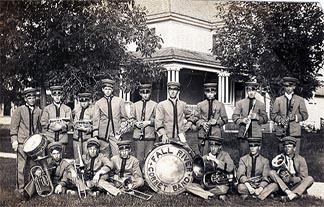 The Village of Fall River in the 1900’s consisted of Tramburg’s Saloon, Weber’s store, the Fall River House (a hotel constructed before the Civil War) and the G. A. R. Hall and of course, the sawmill and grist mill. The Fall River House served as a gathering place for the veterans of the Civil War. The stories and tales swapped there have continued to provide interesting and colorful historical background in our community. Other businesses included the Smith building or drug store which had a large upper story hall, which was used for dances and even the first high school prom, a butcher shop, a harness shop, Burt Hurd’s store, Max Freck’s blacksmith shop and Dyer’s store. The “west” end of town also had many establishments, stores, machine shops and the Fall River Bank. These are some of the earlier establishments. 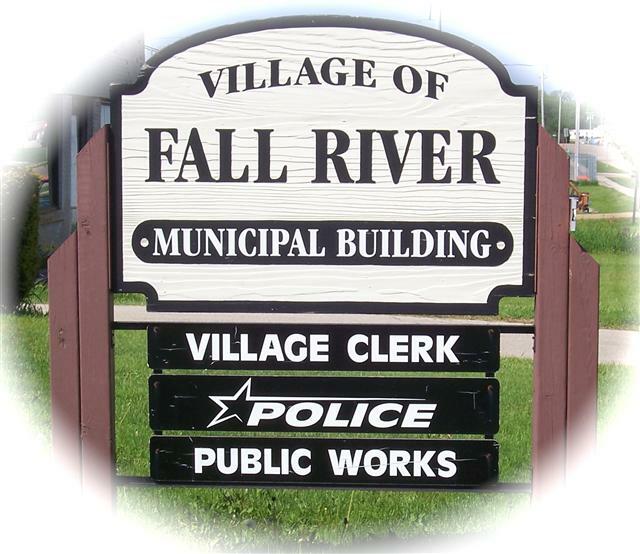 Although some of the buildings have remained after remodeling and refurbishing, the Village of Fall River has continued to grow and change. Visiting today, you would, however, recognize the “west” end and “east” end and the long New England style main street.